The countdown has begun for December 25 and here at Volume by Alcohol we decided to spread the cheer in a more adult fashion, a Beer Advent Calendar. Every day we will count down to December 25 with one unique beer, since we’ll be enjoying these brews on the actual date of the calendar we will post about them on the following day. These will not be extensive beer reviews but more of a snap-shot. Hopefully you will find these helpful and can locate some of the beers we will be discussing at your local bottle shop or pub! No-Li Brewing is based out of Spokane, WA and was previously known as Northern Lights Brewing. They re-branded themselves and actually ended up on one of our favorite beer blogs, Oh Beautiful Beer, for their label art a few times. 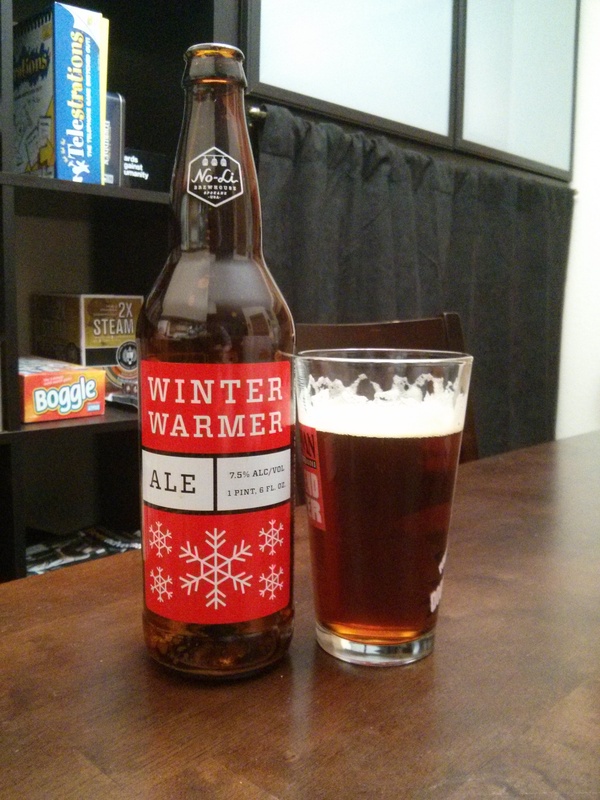 Their seasonal Winter Warmer has been hitting shelves across Washington and is our Day 8 beer. The beer poured a copper-red color with a frothy white head that laces the glass. The aroma is lightly of hops but mainly a sweet malt character with a bready afterthought. You also get some of the usual Winter spices in there like nutmeg and cloves. The first sip gives off toffee and malts, you get some dried fruits and fig as well mixed with the spices. The ending of the sip leaves a sticky, sweet syrup-like residue on your tongue. Winter Warmer is not an overly sweet beer, in fact you get a good amount of pine-forward hops in each sip, it has a nice balance of sweet and bitter. The beer was super carbonated while pouring however when drinking it did not give off a carbonated bite like I was expecting. While No-Li Brewing is not nationally distributed (to our knowledge) if you ever find yourself in Washington State it is highly recommended that you seek them out, whether it is on draft at a pub, a bottle from a grocery store, or you make the trek our East to Spokane.